“The waters of the Atlantic, the heat of the sun, the volcanic soil and the trade winds are the four elements that play together to give life to the white, crystalline petals of the salt blossom, carefully collected in the traditional way”. In this way the Salt Blossom, collected from the salt pans of Fuencaliente is presented to the world. A flower born at dusk. At dusk in the warm summer days when the trade winds retreat towards the ocean, the fine layers of salt are collected before they can sink to the bottom. This needs a lot of care by the person who collects it and a tool, called a “cedazo” in the shape of a large sieve. This way we can preserve the valuable qualities of this blossom: all the minerals and oligo-elements that the sea brings forth. The main asset of this product is its low content of sodium and high content of magnesium salts, giving it a special taste, softer and better than other salts. 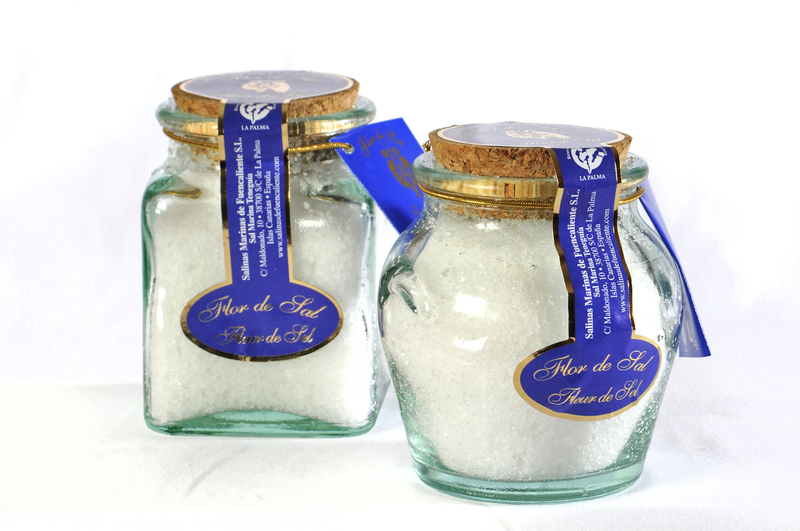 This is an ideal salt for dishes that are consumed immediately, without dissolving the grains of the salt blossom, as these grains are of a soft texture with a delicate taste of the ocean. The salt blossom of the SALINAS DE FUENCALIENTE, with a delicate taste of the ocean, gives an exquisite flavour to your dishes and no doubt will satisfy the tastes of the most demanding palate.